Marshall University is a public research university in Huntington, West Virginia. It was founded in 1837 and is named after John Marshall, the fourth Chief Justice of the United States. The university is currently composed of nine undergraduate colleges: Lewis College of Business (LCOB), College of Education and Professional Development (COE), College of Arts and Media (COAM), College of Health Professions (COHP), Honors College, College of Information Technology and Engineering (CITE), College of Liberal Arts (COLA), College of Science (COS), and University College; three graduate colleges, the general Graduate College, the School of Pharmacy, and the Joan C. Edwards School of Medicine; and a regional center for cancer research, which has a national reputation for its programs in rural healthcare delivery. The forensic science graduate program is one of nearly twenty post-graduate-level academic programs in the United States accredited by the American Academy of Forensic Sciences. The university's digital forensics program is the first program in the world to receive accreditation in digital forensics from the Forensic Science Education Programs Accreditation Commission (FEPAC). The Lewis College of Business is amongst only 1% of global business schools to have achieved dual AACSB accreditation in Business and Accounting. Marshall University has a non-residential branch campus, focused on graduate education, in South Charleston, the Marshall University - South Charleston Campus, which also offers classes throughout the southern half of the state, including at the Erma Byrd Higher Education Center in Beckley. It also offers undergraduate courses, under three "centers", the Southern Mountain Center, operating on the campuses of the Southern West Virginia Community College in Logan and Williamson and at the YMCA in Gilbert; the Mid-Ohio Valley Center in Point Pleasant and the Teays Valley Center in Hurricane. Marshall University also operates the Robert C. Byrd Institute, with operations on both the Huntington and South Charleston campuses, as well as in Fairmont, West Virginia. The institute's goal is the transfer of technology from the academic departments to private industry to support job development in the region. 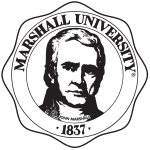 Marshall University was founded in 1837 as a private subscription school by residents of Guyandotte and the surrounding area. The landmark Old Main, which now serves as the primary administrative building for the university, was built on land known as Maple Grove, at the time the home of the Mount Hebron Church in what was then the state of Virginia. John Laidley, a local attorney, hosted the meeting which led to the founding of Marshall Academy, which was named after Laidley's friend, the eminent John Marshall who had served as the fourth Chief Justice of the United States from January 1801 to July 1835. On March 30, 1838, the institution was formally dedicated by the Virginia General Assembly as Marshall Academy; however this institution was not a college level institution as that was understood at that time. In 1858, the Virginia General Assembly changed the name to Marshall College, but this change still did not reflect its status as a true college. The Civil War closed the often financially challenged school for much of the 1860s. Old Main is the oldest building on campus and home to many of the university's administrative offices. Marshall University's John Deaver Drinko Library, which opened in 1998. On June 20, 1863, Cabell County, Virginia, was one of the 50 counties separated from Virginia at the height of the American Civil War to form the State of West Virginia, and the college fell within the new state. In 1867, the West Virginia Legislature resurrected the institution as a teacher training facility and renamed it State Normal School of Marshall College. This began the history of the college as a state-supported post-secondary institution. With the exception of the Old Main building, expansion of the facilities and the college itself did not begin until 1907, when the West Virginia Board of Regents changed the title of the presiding officer from "principal" to "president" and allowed the creation of new college-level departments. At that time, enrollment surpassed 1,000 students. The school began offering four-year degrees for the first time in 1920. In 1937, the college suffered through a devastating flooding by the Ohio River. Numerous structures, such as Northcott Hall and the James E. Morrow Library were extensively flooded. Much of Huntington was also heavily damaged, and as a result, a floodwall was constructed around much of the town to prevent future occurrences. The West Virginia Board of Education authorized Marshall College in 1938 to offer the master's degree in six programs: chemistry, education, history, political science, psychology, and sociology, as the institution underwent another expansion. In that year the school was accredited as a "university level institution"; however, elevation to university status would remain a contentious political issue for decades to come. Further expansion accelerated after World War II. In 1960, John F. Kennedy spoke at the college during his cross-country campaign for the presidency. On March 2, 1961, West Virginia Legislature finally elevated Marshall to university status, and the legislation was signed by Governor W. W. Barron. The student newspaper, The Parthenon, prepared two front pages for the day, depending on the outcome of the legislature's vote. Also in 1961, WMUL-FM began operations as the first public radio station in West Virginia. The station, which began in the Science Building at 10 watts of power, now broadcasts from the Communications Building with 1,400 watts. In 1969, the university's athletic program, facing a number of scandals, fired both its football and basketball coaches and was suspended from the Mid-American Conference and from the National Collegiate Athletic Association. The university rebuilt its athletic program back to respectability, and in 1977, the university joined the Southern Conference. Inscription at the burial site for the unidentified victims of the 1970 plane crash. On the evening of November 14, 1970, the Thundering Herd football team, along with coaches and fans, were returning home to Huntington from Kinston, North Carolina. The team had just lost a game 17–14 against the East Carolina University Pirates at Ficklen Stadium in Greenville, North Carolina. The chartered Southern Airways Flight 932 crashed on approach to the Tri-State Airport after clipping trees just west of the runway and impacting, nose-first, into a hollow. All seventy-five people on board were killed, including 37 players and 5 coaches. 13 members of the team, as well as the members of the freshman football team, who were not eligible to play varsity under NCAA rules at that time, were not passengers. The following season a new head coach, Jack Lengyel, was hired. The leaders of the "Young Thundering Herd" (to which the team officially changed its name for the 1971 season) were the few players who did not make the trip due to injury or disciplinary action. Additionally, there were 15 sophomores from the previous year's freshman team. The squad was also composed of freshmen players who were allowed to play at the varsity level due to the National Collegiate Athletic Association, college football's governing body, waiving a rule prohibiting it. Three years later, it would waive the rule for all schools. Completing the squad were players from other Marshall sports programs. They would win only two games in 1971. Their first win was an emotional 15–13 victory against Xavier University in the home opener. Their second win, in their homecoming game, was against the Bowling Green State University Falcons. A fountain and plaza at the center of the school campus is dedicated to the seventy-five victims. The water does not flow from November 14 until the first day of spring football practice the following year. The tragedy and its aftermath were the subject of several documentaries, including the award-winning Marshall University: Ashes to Glory. The tragedy and the rebuilding efforts were dramatized in the 2006 Warner Brothers feature We Are Marshall, which opened in Huntington a week before its national release date. Many scenes in the movie were filmed on the campus and throughout Huntington. In 1971 the Williamson and Logan campuses of Marshall University were combined by the West Virginia Legislature to form Southern West Virginia Community College (now Southern West Virginia Community and Technical College). In 1977 the university founded its School of Medicine, the first professional school and the first doctoral program. Over the next 20 years the school would add doctoral programs in many fields. Twenty years later, in 1997, the West Virginia Graduate College became the graduate college of Marshall University. Its campus is located in South Charleston, West Virginia. In 1998, the John Deaver Drinko Library opened on campus. The center includes a 24-hour study center and a coffee shop, and has both wired and wireless networking throughout the building. John Deaver Drinko graduated from the university in 1942. In 1997, Marshall merged with the University of West Virginia College of Graduate Studies (COGS), with the latter being renamed Marshall University Graduate College. In 2010 the university was authorized to begin offering undergraduate classes in South Charleston and renamed the facility Marshall University - South Charleston Campus. Marshall's enrollment was 16,500 in 2004. In addition to the main campus in Huntington and the branch campus in South Charleston, West Virginia, the school maintains undergraduate centers in Gilbert, Point Pleasant, and Hurricane, West Virginia. In 1989, Marshall was governed by the University of West Virginia Board of Trustees, but this ended in 2000. Several new facilities have been recently completed all around the Huntington campus. These buildings include two new first-year student residence halls, a health and recreation center, an engineering lab facility, softball field, and an artificial turf practice field that is open to the public. The Marshall University Foundation Hall, home of the Erickson Alumni Center, finished construction in 2010. In 2013 Marshall began construction on a new indoor practice facility, a new soccer field and the Applied Engineering complex. In July 2005, Dr. Stephen J. Kopp took over as Marshall University's president and Dr. Gayle Ormiston serves as the Provost and Senior Vice President for Academic Affairs. The eight college deans are Dr. Robert Bookwalter (COLA), Don Van Horn (CAM), Dr. Teresa Eagle (COEPD), Dr. Wael Zatar (CITE), Dr. Avinandan Mukherjee (COB), Dr. Chuck Somerville (COS), Dr. Michael Prewitt (COHP) and Dr. Joseph Shapiro, the dean of the Joan C. Edwards School of Medicine. On December 17, 2014, the presidency of Marshall University was vacated after the sudden death of Dr. Kopp. The Marshall University Board of Governors met on campus in emergency session on December 18, 2014, to begin the succession process. Board Chairman Michael G. Sellers announced the board would appoint an interim president in early 2015 and will likely take from six to nine months to appoint a permanent replacement. Until an interim president was selected, the board authorized the university senior leadership team/university cabinet to oversee operations. The Board of Governors announced on December 29, 2014, that Gary G. White, a member of the West Virginia Higher Education Policy Commission and former chairman of the Marshall University Board of Governors, will serve as interim president of the university, effective Thursday, January 1, 2015. It was also announced that White will resign from the West Virginia Higher Education Policy Commission to take on the role of interim president and would not be a candidate for the permanent position. The Marshall University Board of Governors named Mississippi State University Provost Jerome A. "Jerry" Gilbert the 37th president of Marshall University on October 20, 2015. The scholarship and achievements of Marshall's faculty are also bringing more attention to the university. Dr. Jean Edward Smith, known for his works Grant and John Marshall: Definer of a Nation, was a finalist for the Pulitzer Prize in biography. The Higher Education for Learning Problems (H.E.L.P.) program founded by Dr. Barbara Guyer assists students with learning disabilities and related disorders complete their college education. Marshall offers two prestigious and academically rigorous scholarship programs: the John Marshall Scholars and the Society of Yeager Scholars program. The university maintains major involvement in the arts of the surrounding Appalachian region. The Joan C. Edwards Performing Arts center is a state-of-the-art, 530-seat facility for studies in the fields of music, art, and theatre. The Jomie Jazz Center is a $2.6 million facility that houses the university's study program in jazz. In April 2007, Marshall's Joan C. Edwards School of Medicine was ranked fifth in the nation in producing family physicians, according to the Accreditation Council for Graduate Medical Education. In 2005, Marshall alum and Chicago Tribune reporter Julia Keller won the Pulitzer Prize for Feature Writing. CNN White House correspondent Joe Johns also is a Marshall alum. In 2016, Marshall's Forensic Science Graduate Program ranked #1 in the United States based upon scores on the Forensic Science Assessment Test (FSAT), which is a qualifying test offered by the American Board of Criminalistics. It was the 7th time in 10 years that the program was ranked number #1 overall. In 2011, Marshall's Digital Forensics Graduate Program was the first program in the United States to obtain full accreditation in digital forensics from the Forensic Science Education Programs Accreditation Commission (FEPAC). The school's general engineering program was closed in 1970, but was reborn with a graduate program in 1993, and a general engineering undergraduate program in 2006. MU also allows students to complete the first two years of a specific engineering degree and then transfer to one of the two campuses of West Virginia University. MU has a goal of developing specific engineering programs of its own. MU has granted the master's degree since 1938. Building on the School of Medicine, the school began granting other doctoral degrees in 1994. Previously students would complete work at Marshall, but the degrees would be awarded by West Virginia University. MU now offers the PhD in Biomedical Sciences, the EdD in Educational Leadership or Curriculum and Instruction, and first professional doctorates in Nurse Anesthesia, Psychology, and Physical Therapy. The university has added a Pharmacy School, starting in 2012, with the first class graduating in 2016. Marshall's athletic teams are known as the Thundering Herd. The school colors are kelly green and white. Marshall participates in NCAA Division I (FBS for football) as a member of Conference USA. The name Thundering Herd came from a Zane Grey novel released in 1925, and a silent movie of the same name two years later. It was originally used by The Herald-Dispatch sports editor Carl "Duke" Ridgley, but many other nicknames were suggested over the next thirty years including Boogercats, Big Green, Green Gobblers, Rams, and Judges. In 1965, students, alums and faculty settled on Thundering Herd in a vote, and Big Green was given to the athletic department's fund-raising wing. Sports at the school include women's softball, swimming & diving, tennis, volleyball, and track & field; men's football, baseball; and teams for both genders in basketball, cross country, golf, and soccer. Joan C. Edwards Stadium at dusk. Marshall began playing football in 1895 and has a long tradition as a football school. The student-run Campus Activities Board organizes a vibrant and exciting calendar of free campus-wide events; plus, you’ll find more than 200 student organizations at Marshall. Fraternities and sororities have also been an active part of student life here for more than 100 years. When it comes to live shows, just look to the Marshall Artists Series. The Series brings Broadway, dance, music, comedy, and opera performances to town each semester, as well as two international film festivals. As a student, you’ll receive free tickets to all Marshall Artists Series productions and to all theatre productions at the Joan C. Edwards Performing Arts Center. Marshall students can also obtain free athletic tickets with their Marshall ID. There are 17 chapters on campus that are members of one of three communities: the Interfraternity Council (IFC), the National Pan-Hellenic Council (NPHC), and the Panhellenic Council (PHC). We believe there is a place for everyone in our growing and ever-changing community. Fraternities and sororities have a rich history at Marshall University and have been on campus for 96 years. Sigma Sigma Sigma was the first national organization and it was established on campus in 1922. There are ten residence halls located on the main campus. Freshmen students can live in one of several residence halls dedicated to first-year students. Livinglearning communities give students the option to live alongside those with similar interests. Marshall also provides many opportunities for student living for upperclassmen. Among them is Marshall Commons, with four residence halls: Gibson, Wellman, Haymaker, and Willis, along with the Harless Dining Hall. Each is a four-story co-residence hall, made up of four-person single suites, four-person double suites, and eight-person double suites. Marshall University broke ground on a new graduate student housing complex on the Fairfield Campus of the Marshall University Joan C. Edwards School of Medicine in June 2018. The graduate housing project, located adjacent to the Erma Ora Byrd Clinical Center, will feature 200 units for apartment-style living and will accommodate pharmacy and medical students as well as resident physicians. Buskirk Hall Central campus All female dormitory. Twin Towers East Central campus Male and female dormitory. Twin Towers West Central campus Male and female dormitory. Holderby Hall Central campus Male and female dormitory. Marshall Commons Central campus Male and female dormitories. Freshman North & South Residence Halls Central campus Male, female and co-ed dormitory. Freshmen only. Randy Moss - Former pro football player and member of NFL Hall of Fame Class of 2018. ^ "U.S. and Canadian Institutions Listed by Fiscal Year 2016 Market Value of Endow" (PDF). NACUBO. Retrieved March 24, 2017. ^ "Office of the President". Marshall University. Retrieved March 22, 2018. ^ a b c d "MU Quick Facts". Marshall University. Retrieved August 22, 2016. ^ "Marshall University Brand Guidelines" (PDF). Retrieved February 12, 2017. ^ "AAFS". Archived from the original on February 18, 2013. ^ a b Brown, Lisle, ed. "Marshall Academy, 1837." Marshall University Special Collections. Sept. 1, 2004, Dec 20. 2006. ^ "UPDATE: Marshall BOG Meets to Discuss Steps to Name Interim President". ^ "Board of Governors Name White Interim President". ^ "Select Your Degree or Certificate Program | MU Graduate College". Marshall.edu. Retrieved September 28, 2015. ^ "School of Pharmacy". Marshall.edu. July 21, 2015. Retrieved September 28, 2015. ^ "Official Athletic Site of Marshall Thundering Herd :: Traditions". Herdzone.Com. Retrieved September 28, 2015. ^ "HERDZONE.COM :: Official Athletic Site of Marshall Thundering Herd :: Sports Finder". Herdzone.cstv.com. Retrieved September 28, 2015. ^ a b "Marshall University Fraternity and Sorority Life". Muwww-new.marshall.edu. June 20, 2014. Retrieved July 25, 2016. ^ Mayne, Rick. "Huntington Quarterly | Articles | Issue 73 | Clint McElroy". www.huntingtonquarterly.com. Retrieved August 27, 2018. Wikimedia Commons has media related to Marshall University.